It’s been a busy 2 weeks for me and my wife. Aside from the usual frantic fun of raising Malcolm, we’ve been doing a lot of running back and forth from the farm to be with family. I did manage to take a bunch of photographs there, but today I wanted to post an older photo. You see, my wife’s grandmother passed away last weekend. She had been battling cancer for several years and, much to our sorrow and great relief, she is finally at peace. I didn’t know her for very long, nor all that well, but I liked her tremendously. She was sweet and thoughtful; always putting others before herself. She was also strong – even in the frailty oif her later days she exuded a quiet confidence that made you lean in and listen. It was an experience just to be near her, and I am grateful for each moment that I stood in her presence. 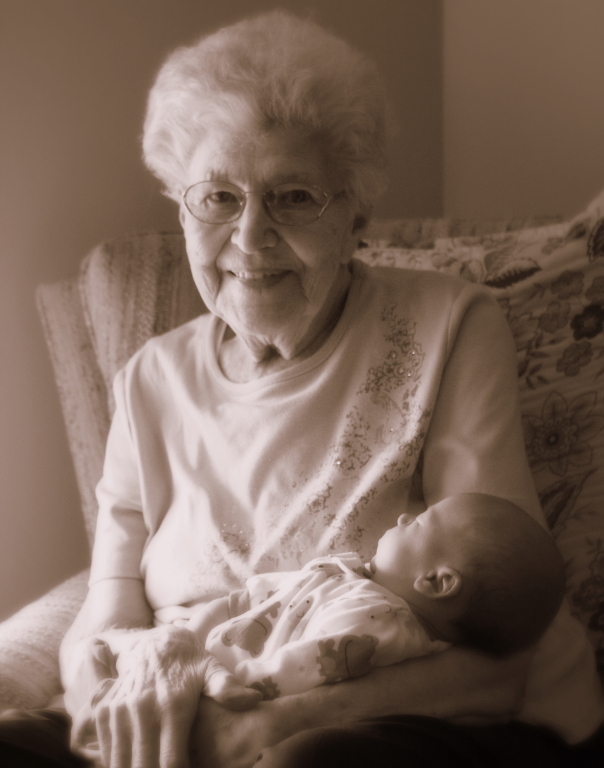 She left behind a huge legacy of love and commitment that will be carried forth in her 10 children, their spouses, and in her near innumerable grand children and great grand children (last count put us at 88 altogether). This is the last photo I took of Gertrude Kuhl. She’s holding our son Malcolm. I am so happy we have this photo, so that when we tell him about her, and we will, he can see who she was and know that for the brief time they were together, she loved him.